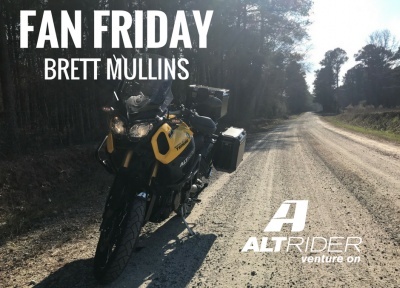 Friday is our day to celebrate fans, and this week we talked to 37 year-old Brett Mullins from Greensboro, Georgia, who has been riding since he was 15 years old. Mullins is an equal-opportunity rider in every sense of the word, owning everything from his newest adventure bike to a cruiser, dirt bike and two sport bikes. His garage shows the evolution of riding styles that many riders seem to go through these days, graduating from sport bikes and cruisers and moving to the latest adventure motorcycle. While he still has plenty of fun on his 2013 Harley-Davidson Forty-Eight, 2012 Yamaha WR250R, 1998 Yamaha R1 and 2001 Honda RC51, his latest toy is a 2016 Yamaha Super Tenere. It’s one of our favorites too. To outfit his Super Tenere, Mullins has installed AltRider Crash Bars and an AltRider Clear Headlight Guard, as well as an AltRider decal kit. He’ll need the added protection, as Mullins’ adventure ambitions are not for the faint of heart. He dreams of completing the Trans-America Trail, a 5,000 mile West-bound dual sport ride that spans from North Carolina to Oregon. He also wants to add Taste of Dakar to his bucket list. We appreciate the love, Mullins! As always: Venture On.